True North Tavern Bourbon & Cigar Dinner - San Diego Dining Dish! On Wednesday, June 3, partake in drinking good whiskey, smoking fine tobacco, and savoring a delicious meal pairing at True North Tavern’s Bourbon and Cigar Dinner! A four-course meal will be prepared that emphasizes whiskey in dishes like Beef Brisket Rillette served with pickled mustard seeds, rye toast and an apple bitters jam,Charred Romaine topped with feta, pumpkin seeds and grilled peaches in a maple-whiskey vinaigrette, and Smoked Chicken Cordon Bleu with pickled Fresno creamed corn and a caramelized honey and Bulleit Rye barbecue glaze. Pause for a sip of bourbon and puff of one of the three featured cigars before returning to a Strawberry and Rhubarb Galette drizzled with a marshmallow syrup and served with a Bulleit Bourbon and Kona coffee. Perhaps you have some San Diego Dining Dish! readers that are new to the world of whiskey and cigars? No fear! 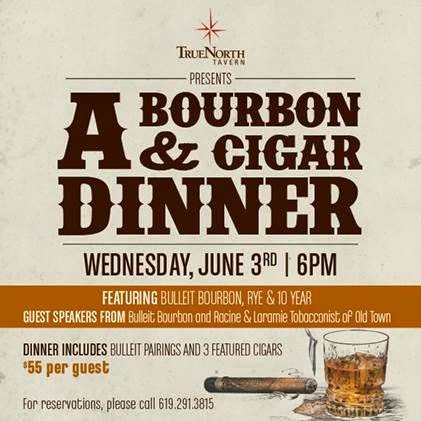 Guest speakers from Bulleit Bourbon and Racine & Laramie Tobacconist of Old Town will be present during the dinner to explain some of the finer qualities of their crafts. True North Tavern is located on 30th Street in the heart of San Diego’s hip North Park neighborhood. The dinner is $55 per person and begins at 6pm. Reservations can be made by calling 619.291.3815.